Medicare is confusing. We're here to help. 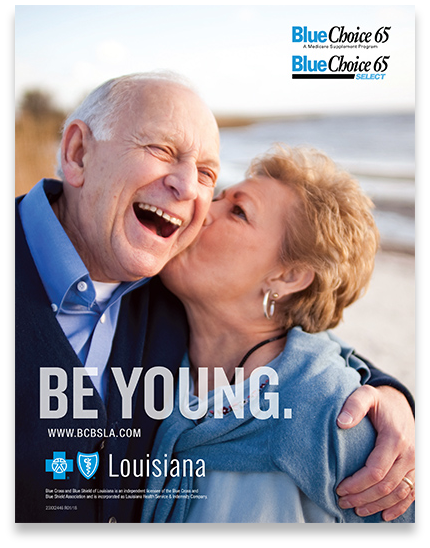 Blue Cross and Blue Shield of Louisiana is here to help you find the right type of coverage for your needs. Get your FREE Medicare Supplement Guide. Original Medicare alone covers only about 80% of your medical and hospital expenses. YOU are responsible for the rest. Reply today to learn how a BlueChoice 65 Medicare Supplement plan provides the coverage you need for the out-of-pocket costs Medicare doesn’t pay—and gives you the freedom to choose your own doctors. The fastest way to get your FREE GUIDE is to call 1-800-489-5586 (TTY 711) or fill out the form below. By providing your phone number or email address, you grant permission for an authorized agent to contact you. BlueChoice 65 refers to contracts #40XX1488, #40XX1489, #40XX1490, #40XX1491 and #40XX2429; BlueChoice 65 SELECT refers to contracts #40XX1492, #40XX1493, #40XX1494, #40XX2430 and is not connected with or endorsed by the U.S. government or the federal Medicare program. Please see your agent for benefit exclusions, limitations and reductions. An agent may contact you. Copyright © 2018 Blue Cross and Blue Shield of Louisiana. Blue Cross and Blue Shield of Louisiana is licensed to sell products only in the state of Louisiana.